To safely store passwords and pass phrases. To create and work with tokens. To create a login form. To create a logout page. To create a registration form. To create a pass phrase reset form. User registers choosing a username and password, which they must enter twice to make sure they didn't mistype it. If registration is valid, the user's data gets stored in the database, but is not marked as confirmed. An email is sent to the user asking them to confirm their registration. This is to prevent people from registering others without their knowledge. The user clicks on a link in the email confirming their registration. This marks the user confirmed in the database and brings the user to a page with a login form or a link to a login page. The user can then log in with their username and password. If the user doesn't remember their password, they can click a link to reset it. This will generate an email with a password reset link, which leads to a form for resetting the password. The user can also update their data, including their password, on their "my account" page. 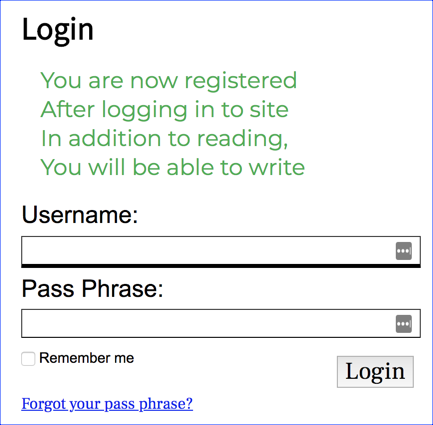 The users table in our poetree database looks like this: Notice that, instead of a traditional password, we are using a pass phrase (pass_phrase). Long pass phrases can be easier for users to remember and more difficult for hackers to discover than shorter complex passwords. The password (or phrase) to be hashed. An integer representing the hashing algorithm. PHP provides several constants holding valid integers. You will most likely use the PASSWORD_DEFAULT algorithm, but you can check out other options at https://www.php.net/password_hash. 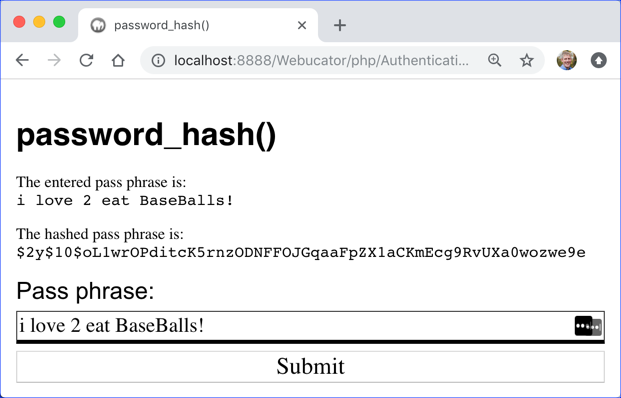 The following demo shows how the password_hash() function works. For security reasons, you should never return the password to the browser, send it by email, or even store it in a database or a file in its raw form. An email is sent to the user asking them to confirm their registration. The user clicks on a link in the email confirming their registration. This marks the user confirmed in the database. A token is associated with a user through the user_id field. The token_expires field will hold the date and time that the token expires. The token field has a unique constraint, so we can be sure that searching for a specific token will only return 0 or 1 records. The users table includes a registration_confirmed field, which will default to 0, indicating that the user has not confirmed their registration. 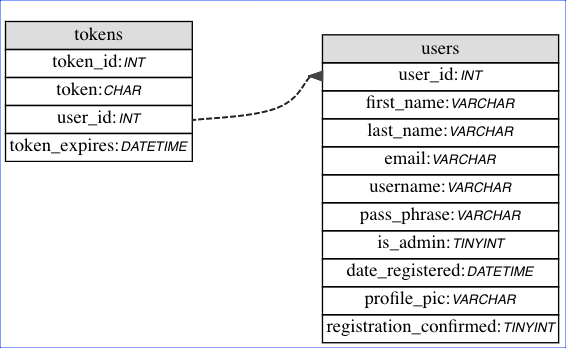 When the user registers, the user data is entered into the users table and a random token is generated and stored in the tokens table with the user_id set to the new user's user_id and the token_expires field set to a date and time by which the user must confirm the registration. The ? will be replaced with the token passed in on the URL. The subquery gets the user_id from the tokens table for the record with that token that has not yet expired, if such a record exists. Duration: 45 to 60 minutes. isAuthenticated() - We will look at this soon. generateToken() - This generates a random string of a specified even length defaulting to 64.
getFullPath() - This is a utility function that creates a full absolute URL from a relative path. logout() - We will look at this soon. registration-confirm.php - This is the page the user visits to confirm their registration. It has been done for you. Review it thoroughly. register.php - This is the page you will be working on. return $protocol.$domainName . implode('/', $pathFromHostSplit) . Next is the page that the user is directed to to confirm their registration. The code is already complete. Review it. // How did you get here?
} // Else no rows were updated. Continue to error message. The first thing it does is check for the existence of $_GET['token']. 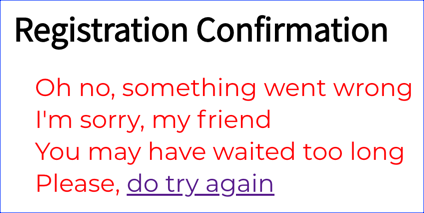 The only proper way to get to this page is through the confirmation email we sent, so if the token doesn't exist, it means the user got here improperly, so we redirect to the home page. After setting $pageTitle and including header.php, we call logout() to force a logout. This is a precaution. It's possible that between the time a visitor registers on the site and confirms the registration, another user has logged in. We will look at the logout() function soon. We then assign $_GET['token'] to $token. If $stmtUpdate->execute([$token]) returns false, the query didn't execute properly (maybe a syntax error?). In this case, we log the error and redirect to the error page. If $stmtUpdate->rowCount() returns 1 (true), we redirect to the login page, passing the just-registered=1 flag. This is where you will do your work. 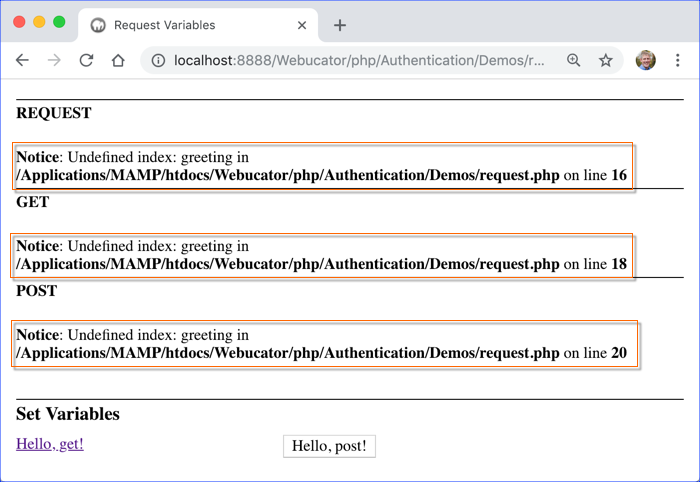 Open Authentication/Exercises/phppoetry.com/register.php in your editor. Much of this code is already done for you. Study the code and make sure you understand everything that is already done. When the user submits the form, we check to make sure the data entered is valid and add error messages to the $errors array as appropriate. We then check to see if the username is already taken. If it is, we add an error message to the $errors array. Did you <a href="pass-phrase-reset.php">forget your pass phrase</a>? Set $hashedPhrase to the hashed user's pass phrase. Create a 64-character token using the generateToken() method in utilities.php. Name the variable $token. Prepare a PDOStatement using $qInserts and assign the result to $stmtInserts. The rest of the code is written. We build a query string using PHP's built-in http_build_query() function. This function will encode the query string to make it safe for URLs. 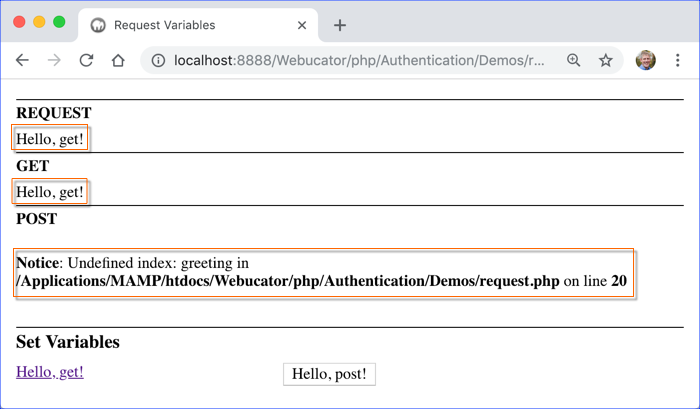 With that query string and the getFullPath() function from utilities.php, we create the URL we will send to the user to confirm the registration. We attempt to send the user the email. If the email was sent, we output a success message: "We have sent you an email with instructions. Check your email." If it was not, we show any errors followed by the form. Note that the first time this page is visited, $registrationMailSent and $errors will both be empty, because those variables are created within the if block that checks if the form has been submitted. Because they are both empty, only the registration form will show up on the page. Register for a new account. Remember your pass phrase! You should get an email asking you to confirm your registration. Click the link and confirm the registration. Look at the users table in PHPMyAdmin. Are you in there? If you get any errors, go back and fix your code. If the registration succeeds, try registering again, but intentionally enter invalid data. Do you get helpful errors? When a user logs into a website, you need to keep track of them throughout their visit. This is done using sessions. A session begins when a visiting client identifies itself to the web server. The web server assigns the client a unique session id, which the client uses to re-identify itself as it moves from page to page on the website. 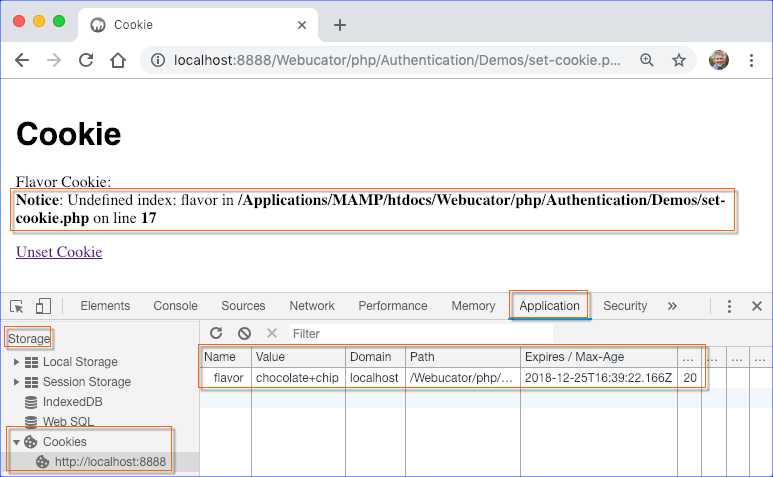 Most of the time, these unique ids are stored in session cookies that expire after the client hasn't interacted with the server for some amount of time. The amount of time varies depending on the web application. For example, an online investment site might have very short sessions, so that if a user leaves their computer without logging out, another user who sits down at the same computer several minutes later cannot continue with the first user's session. The default session length in PHP is 1440 seconds (24 minutes), but you can change this using the session.gc_maxlifetime variable in the php.ini file. Before setting, reading, or unsetting session variables, you need to start the session. This is done using the session_start() function. If a session has already been started on a previously visited page, session_start() will continue with that session. Pages that are part of the session should begin with a call to session_start(). Session variables are created in the $_SESSION superglobal array. Session variables are deleted in the same way as other variables - using the unset() function. Visit http://localhost:8888/Webucator/php/Authentication/Demos/session-variables.php to see this file in the browser. When a user leaves your website and then returns at a later time or date, you may want to remember them from their previous visit. This is done using cookies. Cookies are stored by the browser on the client machine. Web pages with the right permissions can set, read, and delete cookies. Cookies are generally used to track user information between visits. 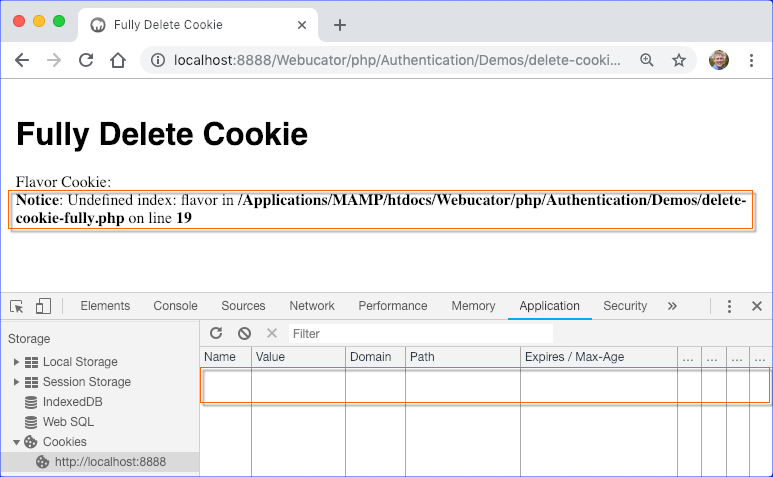 The cookie's expiration date (if this isn't set, the cookie will expire when the browser window is closed). The directory path on the server that can read the cookie. The domain name that can read the cookie. 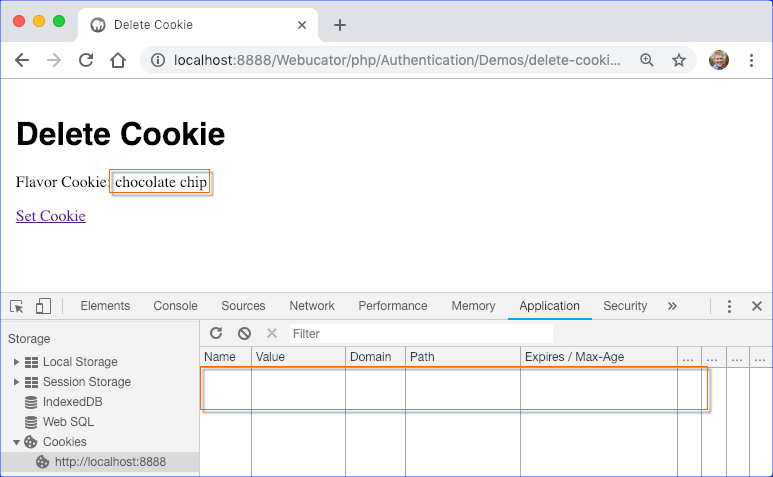 A flag indicating whether the cookie should only be read over HTTPS. The following code will set a cookie that expires in one week. Note that setting the cookie's expiration date to a date in the past only deletes the cookie on the client. It will not delete it on the server. Cookies are set in the HTTP header, so they must be set before any HTML code is passed back to the browser. Visit http://localhost:8888/Webucator/php/Authentication/Demos/set-cookie.php to open this page in your browser. On the left side under Storage, expand Cookies and click on the URL. On the right, you'll see the flavor cookie. Notice the expiration date. The screenshot is from December 18. We set the cookie to expire in 7 days. Click the Unset Cookie link to move to the next demo. This unsets the cookie on the server, but does not delete it on the client. 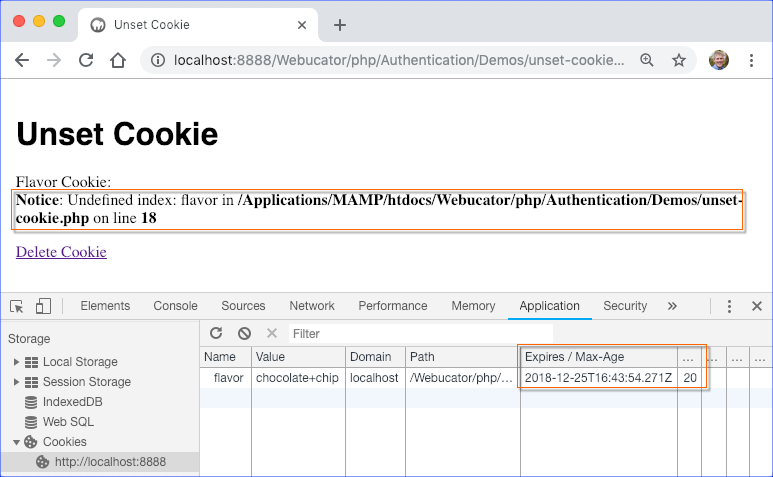 When we try to read $_COOKIE['flavor'] after unsetting it, we get a notice saying the index is undefined. Notice, however, that the expiration date for the cookie has not changed. Click the Delete Cookie link to move to the next demo. Duration: 30 to 40 minutes. 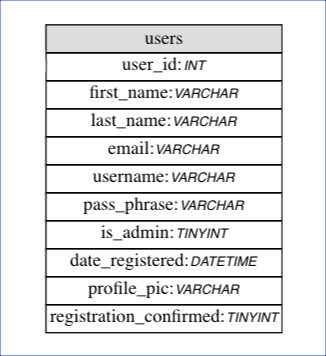 We will use a session variable that holds the user's user id to keep track of a logged-in user during a session. This is safe to do, because the user id is never shared with the browser. We will use a cookie that holds a token to keep track of a user between sessions. We use a token instead of the user's id because this value is transferred between the server and client. For security reasons, we don't want to send the user's id to the client. //      'token' cookie for 30 days (in minutes). //          30 days (in minutes) in the future. //          error and redirect to the error page. //          the error and fail silently. //          set_cookie() returns false), log the error. echo '<article class="poem success">' . 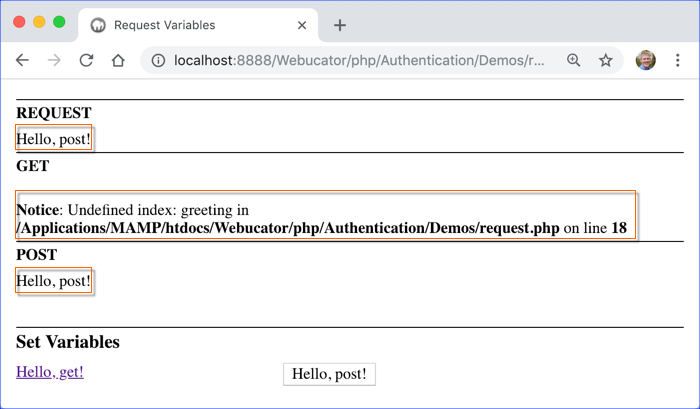 Open Authentication/Exercises/phppoetry.com/login.php in your editor. Beneath the call to logout(), set $username and $passPhrase. If the form has been posted, these should be set to the values posted in the form. If the form has not been posted, they should default to empty strings. Within the try block after $qLogin is set, prepare and execute the $qLogin query. Carefully review the if and first elseif blocks. Set a 'user-id' session variable to the user id returned by the $qLogin query. Use the generateToken() utility function to generate the token. If the insert statement fails to execute, log the error and redirect to the error page. If the insert fails due to a PDOException, log the error and fail silently. If the insert is successful, attempt to set a 'token' cookie that expires in 30 days (in seconds). If this fails (i.e., set_cookie() returns false), log the error. After (and separate from) the cookie code, redirect to the home page. // If $db isn't already set, set it. //    is a token cookie. //      a try / catch block. Open Authentication/Exercises/phppoetry.com/includes/header.php in your editor. At the beginning of the file, write code to start or continue the session. As header.php is included in all of our files, we only have to do this in this one file. Below the code that connects to the database, set a variable called $currentUserId, which will contain 0 if the user is not logged in and will contain the logged-in user's id if 'user-id' is set in $_SESSION. We will be able to use this throughout the site to check if the user is logged in. 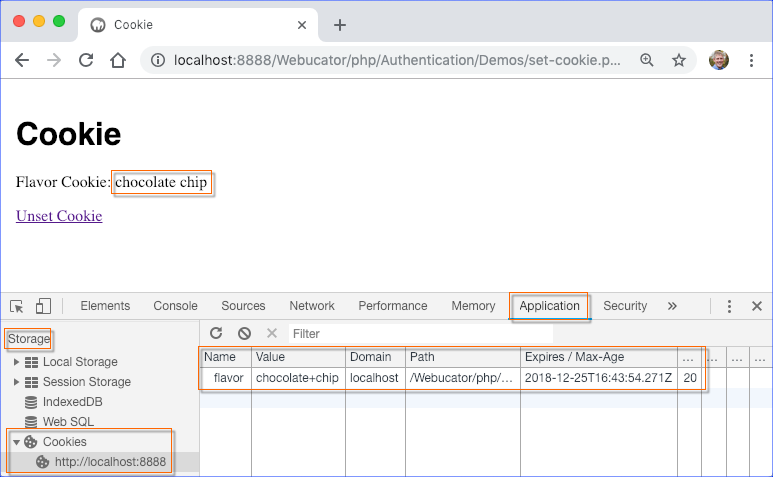 If 'user-id' doesn't exist in $_SESSION, check if there is a token cookie. If there is a token cookie, look for an unexpired match in the tokens table. If there is a match, set $_SESSION['user-id'] and $currentUserId to the user_id associated with that token. Don't forget to wrap the code connecting to the database in a try / catch block. Open Authentication/Exercises/phppoetry.com/includes/footer.php in your editor. Navigate to http://localhost:8888/Webucator/php/Authentication/Exercises/phppoetry.com/login.php and log in with the wrong pass phrase. Do you get an appropriate error? Now log in with the correct username and pass phrase. You should be redirected to the home page. The header should have a My Account link instead of Log in / Register link and the footer should have a logout link. // Could not set cookie on browser. Fail silently. // Likely SQL error. Log and redirect to error page. // Could not insert cookie token. Fail silently. // Do we remember this user? Log in at http://localhost:8888/Webucator/php/Authentication/Exercises/phppoetry.com/login.php using the account you created earlier. Click on the Logout link in the footer. You should be redirected to the home page and no longer be logged in. Now click the Hello, get! link. Notice that "Hello, get!" shows up in $_REQUEST as well as $_GET. Now click the Hello, post! button. Notice that "Hello, post!" shows up in $_REQUEST as well as $_POST. Duration: 30 to 45 minutes. From the login page, the user clicks on the Forgot your pass phrase? link, taking them to pass-phrase-reset.php. On pass-phrase-reset.php, the user enters their email and submits the form. If the email is found, a token is generated and saved in the tokens table, and an email is sent to the user's email address with a link to pass-phrase-reset-confirm.php with the token on the query string. On pass-phrase-reset-confirm.php, the user will be able to reset their pass phrase, unless the token has timed out. The pages are already complete and functioning. Your job is to review them and add detailed comments explaining what each piece of code does. Open Authentication/Exercises/phppoetry.com/pass-phrase-reset.php in your editor. Review and add detailed comments to the page. The goal is to prove to yourself that you understand every line of code in the file by explaining what it does in a comment. Note that we check $_REQUEST for 'token'. We use $_REQUEST because 'token' will be in the $_GET array when the user visits from the link sent to their email and it will be in the $_POST array when the user submits the form to confirm their new pass phrase. If there is any line or block of code that you do not understand, add a comment trying to explain the point of confusion. Attempt to resolve it yourself through studying past demos and exercises and looking at the PHP documentation. If you still are not able to figure it out, review the solution. <input type="password" placeholder="Repeat Pass Phrase"
Open Authentication/Exercises/phppoetry.com/pass-phrase-reset-confirm.php in your editor. Review and add detailed comments to the page.